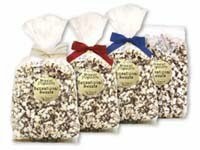 Sensational Sweets Gourmet Dark Chocolate Drizzled Popcorn is now available at The Chocolate Rose Shoppe in Madison, NJ. They use a special variety of popcorn that has more flavor, is tender and virtually hulless. Then they delicately drizzle it with their own dark milk chocolate blend, this is a surprisingly flavorful combination of salty and sweet. We also carry their Fudge Bites - their own Double Chocolate Fudge, cut into bite-sized pieces and enrobed in a rich, chocolaty blend that is dark, decadent and delicious - A chocolate lovers dream! Lastly we also added their Pollylops - their hand-painted floral chocolate pop creations that are truly Edible Art! They are almost too beautiful to eat, they are the perfect favor for special occasions or for celebrating the seasons. Closed - A charming chocolate shoppe located in the historic downtown of Madison, New Jersey. © Copyright 2009-2011 The Chocolate Rose Shoppe. All rights reserved.